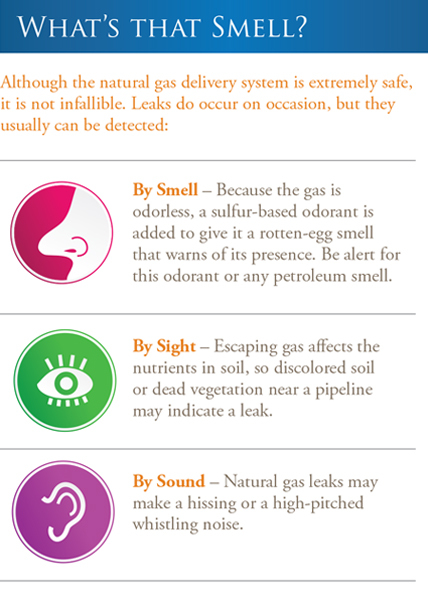 If you smell gas, or if you see or hear any of the warning signs below, leave your house immediately. Do not turn on or off any electrical switches, appliances, or lights, as it could create a spark. Call our emergency number at 1-800-400-4271 or dial 911. In some instances, the smell of gas may be present naturally. However, leaks can occur, and we want to make sure they are resolved as quickly as possible. Natural gas is odorless, but an additive called mercaptan is included to alert people of leaks. Mercaptan has a highly recognizable, sulfur-like, "rotten egg" odor used to help people detect a leak. If you do notice that "rotten egg" smell and suspect a natural gas leak, do not try to find the source of the leak yourself, but leave the building or area and call the 24-hour emergency Peoples number at 1-800-400-4271, or call your local emergency response number. Then stay in a nearby area until a gas company representative or emergency responder arrives, or let the company know where you can be reached. If you observe any of the above conditions, call the Peoples emergency phone number at 1-800-400-4271 and 911 from a safe location.